We discussed in a previous post how people process visual information faster than text-based information. Along these lines we’ve discussed creating custom photography, producing video and using YouTube to promote your business with visual information. 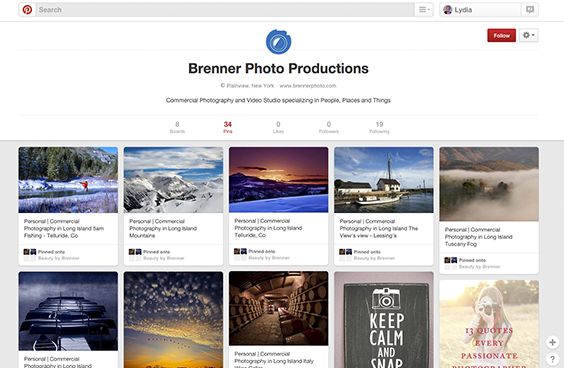 Pinterest is a visual marketing tool that should not be overlooked. The bookmarking site has grown into one of the top social media platforms and currently has over 70 million users, 68% of whom are women. Users collect and pin images in categories that they are interested in and are able to return to in the future for reference. With a strategy in place, you can draw attention to your products and drive Pinterest users to your website. If you don’t know where to start don’t worry. We put together some quick tips. • Upload a profile image that people will associate with your brand. • Add a description about your company. • Name your boards & add a description that tells people what’s on them. • Select a cover Pin that gives people an idea what’s on the board. • Pin at least once a day so followers get fresh content in their home feeds. • Mix in pins from others. • Make sure your pins link to a web page that offers more information. • Add descriptions to your pins to make it more interesting and searchable. • Follow other people’s boards. • Like and comment on pins that relate to your business. Remember, it’s a social site. • Create group boards and invite people who love your brand to contribute. • Add the Follow button to your website. • Use simple, beautiful high-quality photography & visuals. • Opt for vertically aligned Pins with a width of 736 pixels (minimum 300 pixels). They display better in mobile. • Minimize the amount of text on an image. • Pin descriptions can be as long as 500 characters, but limiting it to 200 characters is recommended. • Write well thought out, timeless copy. Pins should last forever, so avoid promotional information. • Include a call-to-action with actionable language that tells a reader what to do and why they should do it. Studies show pins with CTAs have an 80% increase in engagement over pins without CTAs. Product Pins include real time pricing, availability and where to buy it. Pinterest pins with prices get 36% more likes than those without. Recipe Pins include ingredients, cooking times and serving info. Images with recipes get 42% more clicks than pins without. Place Pins include a map, address and phone number. Article Pins include headline, author and story description helping Pinners find and save stories that matter to them. Think about what the people who are looking at a particular Pin might have searched for. Was it a sweater, or was it an argyle sweater? A blue sweater or a cashmere sweater? Mention the most compelling and distinct parts of the image in your description, and your Pins are more likely to surface when people get specific in searches. It’s also super important to include thoughtful descriptions that will appear beneath images people Pin from your website. Go to the developer site to learn how to add descriptions to the Pin It buttons on your site. Recipes: Describe the main ingredients of the dish and how to cook it. Fashion: Include what kind of clothing, the designer or season to wear it. Travel: Tell people the location and the kinds of things you can do there. Do-It-Yourself: Describe what it is, how you make it and what materials people need. Photography: Name the photographer, year, subject or publication. Is Pinterest part of your content marketing plan? Please tell us about your experience and how it’s been working for you. Share your tips and thoughts with us in the comments below.